From our online shopping store in Pakistan you can search and find out External Optical Audio Sound Card USB 2.0 Adapter for Pc Laptop by Leaders from the category of External Sound Cards that is of imported quality and is available to you at best price in Pakistan from online shopping in Pakistan. It is full duplex recording and playback audio stream without sound card in PC. It will receive playback audio stream via USB from PC and transmits it to the USB audio controller. It supports 32 KHz, 44.1 KHz and 48 KHz in digital recording and 48 KHz in analog recording and 48 KHz in digital/analog audio playback. This package includes 1 x USB Cable, 1 x 6 Channel Sound Card and 1 x Driver CD. 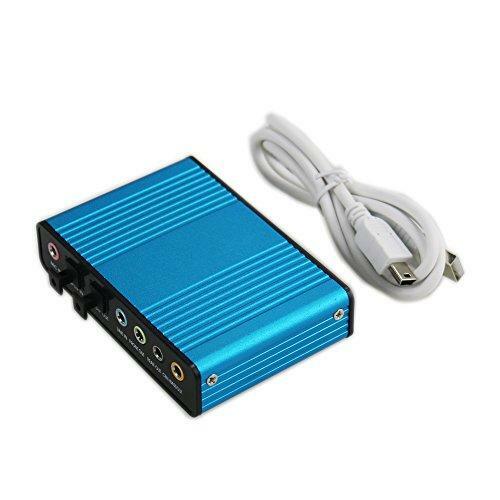 This External Optical Audio Sound Card USB 2.0 Adapter for Pc Laptop is compatible to Win98SE/ME/2000/XP/Mac OS 9.1. You can explore more from our online shopping store in Pakistan from the category of External Sound Cards such as; Optimal Shop New USB 6 Channel External Sound Card 5.1 Surround Adapter Audio S/PDIF for Laptop, Sewell Direct Sound Box External USB Sound Card 7.1 and 5.1 Channel Audio (SW-29545), Creative Sound Blaster Omni Surround 5.1 USB Sound Card with High Performance Headphone and many more. You can place order and get this external USB card at best price in Pakistan from online shopping in Pakistan.